Last month marked the 40th anniversary of Jaws, the iconic thriller that made everyone scared to go into the water. In an eerie twist of fate, this anniversary has coincided with a startling rise in shark attacks along the East Coast—a record-breaking eight people were attacked off the coast of North Carolina in June alone. And just days ago, the world held their breath as pro surfer Mick Fanning fought off a shark on live television. Here at Domo, we talk a lot about how arming yourself with data leads to better decisions and mitigated risk. It’s a fundamental principle that holds true for all kinds of situations—including, of all things, shark attacks! OCEARCH, a non-profit organization that researches great whites sharks, offers near real-time tracking of about 130 sharks across the globe with its Shark Tracker. “We’re learning things that 10 years ago we would have never dreamed we could have learned about these species,” said Nick Whitney, marine biologist at OCEARCH. “On average, we’re collecting 100 data points every second—8.5 million data points per day. It’s just phenomenal. Second by second, we can pick up every tail beat and change in posture. With staggering amounts of data, OCEARCH hopes to develop better strategies for conservation. Researchers gather data points on the location, movement, and activities of sharks from a series of dorsal fin tags. When a tagged shark’s fin breaks the surface of the water, it transmits a signal to a satellite. That transmission then sends an estimate of the shark’s location to OCEARCH’s shark-tracking website. OCEARCH has even open-sourced its data, so anyone—from scientist to enthusiast—can watch sharks traverse the ocean. Take, for example, Mary Lee—a 16-foot, 3456-pound great white. 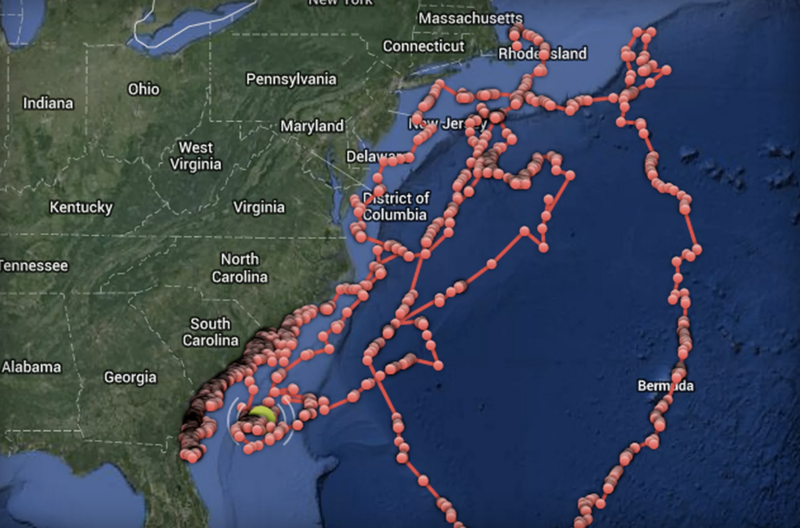 Since being tagged, she has swam most of the Eastern Seaboard, swimming very close to shore. A little too close, at times—OCEARCH once called beach authorities in Florida to warn them. Whether in business or at the beach, meaningful data helps people make better decisions. OCEARCH’s growing repository of data offers unprecedented insights into how, when, where sharks attack—so we can all worry a little more about being sunburned, and a little less about being a snack.